Acting: You will be asked to read from the script (no need to memorize). Sides will be available at the auditions. Dance: All those auditioning will learn an audition dance combination. Please wear comfortable clothing and shoes that you can dance in. Gymnastic abilities a plus. 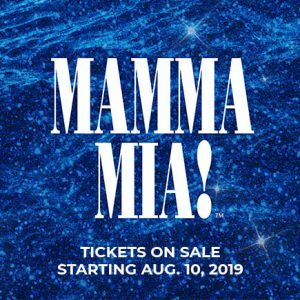 Music: 32 Bars from a Musical of Mamma Mia musical style. Please bring sheet music an accompanist will be provided. Audition form: completed at the audition. Must provide an 8”X10” head-shot and a resume to accompany form. SOPHIE: Free spirited daughter of Donna, on a secret quest to discover her Father’s identity so he can walk her down the aisle. Moves well. Basic guitar skills a plus. Script defines her as 20 years old. TANYA: former Dynamo. Enjoyably between Husbands. Well off. Wry sense of humor. Moves well. ROSIE: former Dynamo. Author and chef. Fiercely independent. Quick wit. Moves well. SAM: Effortlessly dashing. Successful architect. Divorced with 2 kids. Former flame of Donna and possibly Sophie’s father. HARRY: Banking executive from London in a high stress position. Takes pride in his impeccably tailored designer suits. Was a bit of a hippie back in the day. Former flame of Donna and possibly Sophie’s father. Basic guitar skills a plus. BILL: Carefree rugged outdoorsman who never settled down. Journalist. Great sense of humor. Former flame of Donna and possibly Sophie’s father. SKY: Left the corporate world to live full time on the Island were he met and got engaged to Sophie. Helps Donna run the taverna by upgrading their operations. Moves well. ALI: Visiting her BFF, Sophie, on the island for the wedding. Super excited. Strong dancer. LISA: Also visiting her BFF, Sophie, on the island for the wedding. Super excited and super responsible. Strong dancer. PEPPER: Extremely confident. Loves a good time. Fancies himself a charming ladies man. BFF with Eddie. Works for Donna at the taverna. Strong dancer. EDDIE: Also loves a good time. Has a great sense of humor and swagger. BFF with Pepper. Works for Donna at the taverna. Strong dancer. ENSEMBLE: Seeking energetic triple threat performers to portray the population of the intimate island as well as visiting wedding guests. This score requires strong vocals and harmony skills. Everyone will dance. Gymnastics a plus.